One of the most beloved features on Timeline 3D is our ability to create Keynote presentations from your timeline automatically. If you have not used the feature before, it renders 3D images or movie segments based on your timeline and places them in presentation slides creating the illusion of animating through history. Of course, the Timeline 3D application can present your timeline as well, but the nice thing about using slideshow software is that you can integrate your timeline into your other content and also send the slideshow to computers that do not have Timeline 3D installed. Unfortunately, Apple recently made changes to iWork that prevent this feature from working. We were caught off guard, because Apple did not pre-announce these changes before public release (unlike OS updates, which have developer betas). Many of you sent us e-mails to let us know that you are missing this feature. This is not the first time that Keynote has changed the way that it interfaces with third-party apps. When Keynote was first announced in 2003, Steve Jobs highlighted the XML file format, which could be “hacked” by third-party developers. The first time we integrated Timeline 3D with Keynote, we used the Keynote file format to generate the presentations. At some point, the iWork file format changed to a proprietary format, and it became necessary to use AppleScript to build Keynote presentation. In other words, instead of building a Keynote file directly, Timeline 3D instructed Keynote to build the presentation for us. With the most recent release of Keynote (6.0), Apple has completely re-engineered Keynote with more modern technologies and with more iOS compatibility. Unfortunately, they removed most of their AppleScript support, which makes it much more difficult for third-party apps to create or manipulate slideshow content. Apple has hinted that AppleScript support may be coming back in the future, but for now it is gone and so is our ability to control Keynote. Meanwhile, over the past decade, our friends at Microsoft have been opening up their MS Office file formats... For PowerPoint, the latest versions default to the PPTX file format, which is well documented XML format. Fortunately for iWork users, Keynote can also open PPTX files! So, for the past few weeks, we’ve been working on a way for Timeline 3D to export PPTX files. Besides replacing the lost Keynote feature, there are several advantages to this approach. 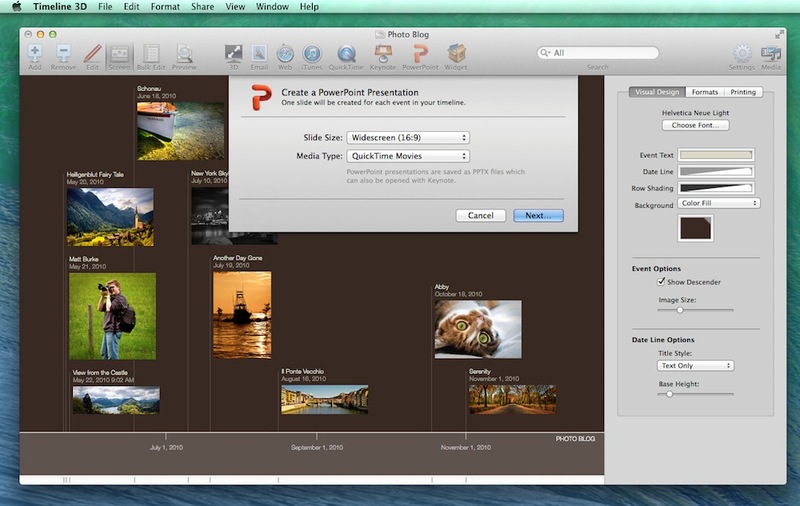 The PPTX file can be opened with Keynote, PowerPoint for Mac, or PowerPoint for Windows. This will make things easier for MS Office users. Because we can generate the file directly, you do not need to own Keynote or PowerPoint to generate these presentations. Even if you do own Keynote or PowerPoint, those applications to not need to launch in order to generate a slideshow. We are adding the ability to create slideshows to Timeline 3D for iOS! The same technology we use to create PPTX files on the Mac can also work on your iPhone or iPad. That means that you can create a PowerPoint or Keynote presentation on your mobile device and then send that slideshow to a PC via Mail or Dropbox, or you can open it directly in Keynote on your iOS device. At this time, Timeline 3D for iOS can create slideshows using still images but not movie segments (the Mac version can do both). This will be a significant upgrade. Especially for our customers who use our software in a Microsoft Windows or MS Office environment. The new slideshow features are available in Timeline 3D for Mac today. The new version of Timeline 3D for iOS has been submitted to the App Store and should be available in the next few weeks. Well, it seems that upgrading to 3.9 has stopped the crash! I have developed a timeline of the history of science in Timeline 3D. I can print it out on two pages using the smallest font and it look fine. I would, however, like to have the years and the notes in bold font like the title. I cannot find where I can control the font for the dates and the notes. I may be missing something, so please tell me if this is possible. In Timeline 3D, I have developed a timeline of the history of science. It prints on two pages using the smallest font and looks fine. I would, however, like to print the dates and notes in bold to make them more readable. I cannot find how to control the fonts for the dates and notes. Please let know if this is possible. In the Mac version of Timeline 3D, the dates and notes are always drawn with a lighter version of the color used for the event titles. In the iOS version, the printing is different. First, it always formats the timeline to a single page. Second, it always prints the text in black. For some themes, it uses a heavier weight font variation for the title, and lighter weight for the other info. But text is always black in order to print with the most clarity. You may want to give the iOS version a try to see if you like it better. If you have any more questions, please contact us at support@beedocs.com. Cheers!